One of the more frustrating clichés in football is that on derby day, the form book goes out of the window. Derbies are different, but only because of the increased levels of pressure. The way in which the players deal with this pressure often has an impact on the final result, though that applies to any match against any opponent. When faced with the prospect of playing against their rivals, some professionals are able to build themselves up mentally and use the increased adrenaline to produce higher levels of substances that enhance performance, like a form of emotional doping. Others can be overwhelmed with nerves and opt instead to hide on the field, afraid of making a mistake. There is a Japanese proverb that says “the stake that sticks up gets hammered down”. This weekend in Brazil we were treated to three clássicos that did a good job of illustrating exactly why playing your rivals is so important. On a historic run of eight defeats in a row, São Paulo managed to stop the rot with a 0-0 draw against Corinthians. With confidence at an all-time low and coach Paulo Autuori’s job hanging by a thread (after only four matches in charge), São Paulo’s prime objective was not to concede and therefore, to avoid a ninth consecutive defeat. Autuori dropped World Cup winner Lúcio from the centre of defence after a series of bad performances and repeated indiscipline. Though it is impossible to doubt Lúcio’s quality, São Paulo looked more secure without him. His absence allowed Rafael Tolói to return to the right centre-back role where he is most comfortable, and it gave their defence more shape and discipline. São Paulo started the match with three defensive midfielders and though they did have space to attack into (Jádson and Fabrício often had two-on-one situations in the middle against Corinthians midfielder Ralf), they did not seem interested in bringing numbers forward. Corinthians were in control for most of the match and kept the play in São Paulo’s half, but they didn’t create many clear chances and appeared to believe a goal would come along naturally. Alexandre Pato was once again disappointing coming off the bench, and many in Brazil are now coming to terms with the fact that he will never become the excellent forward they once thought he was. Corinthians appear to be on auto-pilot mode in the Brasileirão and they have dropped far more points than expected at this early stage. They will most likely focus heavily on winning the Copa do Brasil to ensure a place in the 2014 Copa Libertadores. It wasn’t another defeat, but São Paulo have now gone twelve matches without a win, and they now embark on a trip to Europe and Asia to play the Audi Cup and Suruga Bank Championship respectively, facing teams like Bayern Munich, Manchester City, Milan and Benfica. That winless streak will probably go on a bit longer. In Belo Horizonte, Cruzeiro battered Atlético-MG 4-1, only days after watching them lift the Copa Libertadores trophy. Still in the party mind-set, Atlético fielded a largely second-string side, with only Júnior César and Michel remaining from the team that beat Olimpia in midweek. Often when a squad is as close-knit and successful as Atlético’s, the reserve players are able to step into the first team and perform well, having trained side-by-side with the starters on a daily basis. However, Atlético’s sluggish centre-back partnership of Gilberto Silva and Rafael Marques struggled against a dangerous Cruzeiro team. Since last season, Cruzeiro have conducted some superb business in the transfer market. Dedé, Nílton, Souza, Éverton Ribeiro and Dagoberto are all top-level Série A players, and their attacking unit has plenty of depth with Luan, Ricardo Goulart and Martinuccio keeping the starters on their toes. The signing of Júlio Baptista could also be decisive, and If they can keep him fit he should do well on his return to Brazil. At this stage, Cruzeiro is one of the three or four teams who has what it takes to win the Brazilian championship. The third match, Flamengo versus Botafogo, was a fascinating game in the new Maracanã. However the event raised further questions about the “elitization” of the Brazilian game, about which I would like to go into more detail tomorrow. 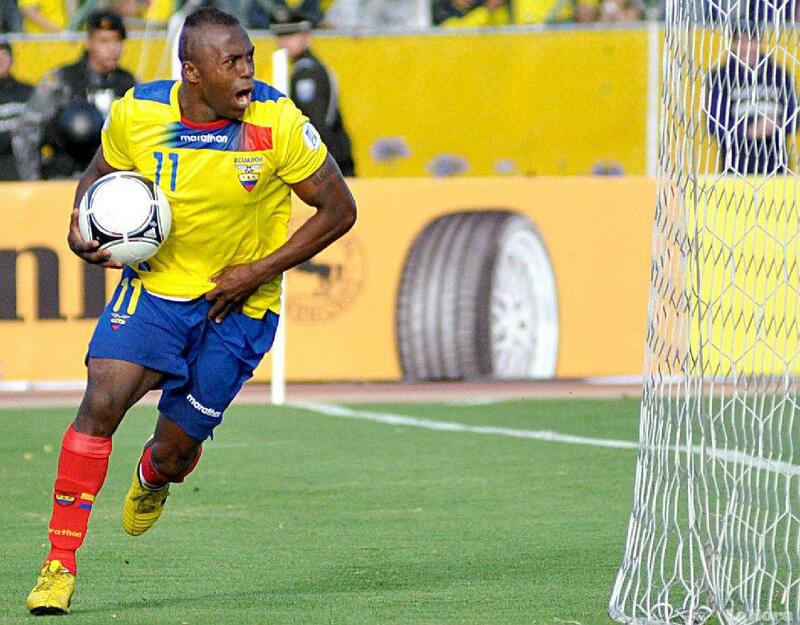 Finally, I would like to pay tribute to Ecuadorian forward Cristián Benítez, who died today in Qatar, aged just 27. Benítez was a wonderful, intelligent and powerful striker who could lead the line on his own and was a class-act on and off the pitch. Earlier this year I suggested he would be reaching his peak just in time to lead his nation in the World Cup in Brazil next year, so it is hard to fathom that he is now no longer with us. My thoughts go out to his family, friends and team-mates. Adiós Chucho, you will always be remembered. Atlético-MG overcame all variety of records, statistics and tabus to clinch their first ever Copa Libertadores trophy last night in Belo Horizonte. Not since 1996 has the team with the best record in the group stage gone on to win the tournament. Not since 2002 has a team lost in the first leg and went on to win the tournament. Not since 1989 has a team overcame a deficit of two goals in the final. Not since 1975 has one nation provided four consecutive Copa Libertadores champions. In the end, they deserved their win. Though Galo had a poor first half, constantly launching aimless high balls against Olimpia’s solid defensive unit, everything changed when they opened the scoring early in the second half. The goal gave them the confidence to shift into Galo doido mode – pressing their opponents high up the field, throwing players forward – as opposed to the apathetic, nervous showing in the opening 45. The goal came from a cross from the right side by Rosinei, who had just been brought on by Cuca. Football commentators and analysts often give far too much importance to coaching decisions made throughout the game, as if the coach is the sole person responsible for winning or losing a match, but in Atlético’s two recent home legs Cuca has made substitutions that have almost instantly resulted in goals. Coincidence? Maybe. The most crucial impact of the first goal was how it improved the performance of the goalscorer, Jô. With his confidence increased, Jô was back to the player we saw in the group stage and early knockout phase, competing for every ball, winning every knock down and posing a constant threat to the Olimpia defence. The Paraguayans went down to ten men after Manzur was sent off, and Atlético began to feed more and more high balls into the penalty box. It isn’t the most efficient of tactics, but with great aerial presence they always threatened to score. With minutes left on the clock, an excellent looping header from Leonardo Silva eventually dropped in at the far post. Again, Atlético’s fate was decided from the penalty spot and some excellent penalties won them the match. It could have been so different though. Had Rosinei not delivered the cross that (only after being fluffed by Wilson Pittoni) fell for Jô to score, had Juan Ferreyra not slipped and fell when facing an open goal, had Leonardo Silva’s header came back off the post instead of creeping into the net, had the referee allowed Miranda to retake his missed opening penalty after Victor encroached a good three yards off his line, perhaps there would be a different name on the trophy. Or maybe Atlético would have won regardless, but in different circumstances. Football is full of fine lines, which makes proper, coherent analysis a tricky job. Meanwhile, at the Morumbi, São Paulo are breaking records of their own after a 1-0 loss to Internacional. They have now gone eleven matches without winning, losing their last eight in a row for the first time in their history. New coach Paulo Autuori has lost all of his first four matches in charge, another record for the São Paulo history books. Earlier this month, I discussed São Paulo’s problems in more detail. Juvenal Juvêncio is running a dictatorship at São Paulo FC. They are one of the few clubs in Brazil not to hold direct elections for the role of president (something Juvêncio himself got rid of to hold on to power). The club’s largest supporters group, the Torcida Independente, is essentially hired muscle for Juvêncio, and in the past few weeks there members have been going around the stadium removing banners criticising the president, and starting chants against Juvêncio’s political “opponent” Marco Aurélio Cunha. Do the common supporters of São Paulo need to rise up and stage a “coup du club”? For today’s post, I would like to briefly digress from South American football and instead talk about the appointment of Gerardo “Tata” Martino as the new head coach of Barcelona. Since the Argentinian was first linked with the vacancy, I have been inundated with questions about his character, his style and his philosophy. It seems that he is something of an unknown quantity outside of South America. Before reading today’s post, I suggest reading this article that I wrote in November of last year, which explains Martino’s footballing ideology in great detail, and Jonathan Wilson’s piece for The Guardian yesterday, which goes deeper into Tata’s history and career. The main question mark over Gerardo Martino surrounds his approach to the game and how that will translate to the tiki-taka style of Barcelona. Many will remember his time in charge of the Paraguayan national team, or more recently his Newell’s Old Boys side that was crowned Argentinian champions this year. Anyone who saw both of these teams would tell you they played a very distinct style of football. Martino’s best attribute is his ability to build a strong team out of the players at his disposal. When in charge of Paraguay, he was stuck with an ageing generation without much young talent coming through, so he did what he could and formed a solid, no-nonsense side, geared towards getting results. At Barcelona, he will have some of the greatest players in the world available to him, so his true footballing philosophy should shine through, as it did at Newell’s. Martino’s approach to the game has its roots in bielsismo (he was the playmaker in Marcelo Bielsa’s famous 1991 Newell’s team), but with a pragmatic twist and some differences. For example, Tata’s teams mark zonally, which goes against Bielsa’s preference for man marking. With Martino at the helm, Barcelona should not act any differently without the ball as they have done under Guardiola and Villanova. When he took charge in 2008, Pep Guardiola (himself a bielsista coach) implemented a very similar pressing system to Martino’s. Where we may see a change however, is when Barcelona have possession. While Guardiola’s approach was to keep the ball, slow down the tempo and toy with the opposition before unleashing lightning-fast breaks into space, Martino follows the three pillars, if you will, of bielsismo: pressing, verticalidad y intensidad. Barcelona’s “death by possession” style which we have become used to may be a thing of the past. Expect Barça to be more intense and direct under Martino. As far as individual roles are concerned, Tata is a firm believer in attacking full-backs, but only when they are also able to track back and provide defensive cover. He also likes to have a deep, central player who can initiate attacking moves from the back. For Paraguay, he had the barrel-chested Nestor Ortigoza, while at Newell’s he had Raúl Villalba and when he left, the responsibility was passed to Santiago Vergini, a centre-back. With Sergio Busquets un-droppable in defensive midfield, it is likely that Martino will again look to a centre-back to fill this deep playmaker role, and there are few technical defenders better than Gerard Piqué. The question remains of what to do with Xavi Hernández. 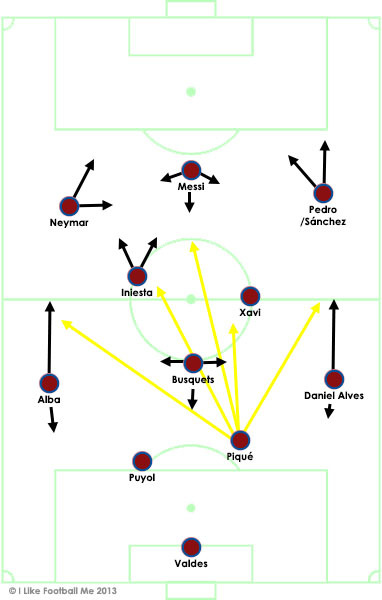 Tata Martino’s 4-3-3 system requires the central midfielders to make darting forward runs and offer a penalty box threat (Andrés Iniesta) and Xavi – a living, breathing monument to tiki-taka – may struggle to find his place in such a role. At 33 years old, his fitness is questionable, but even when at his physical peak Xavi’s style was never about making forward bursts or scoring goals, instead it is about rhythmic, flawless passing and setting the tempo for the whole team. It is difficult to tell while watching from afar, but Barcelona appear to have made a solid decision in appointing Tata Martino. He may never have managed in Europe before, but he arrives with a winning pedigree and more managerial experience than Frank Rijkaard, Pep Guardiola or Tito Villanova had when taking the same job. However outstanding they may be, Barcelona looks like a team in need of a dash of fresh perspective and thinking, so bringing in Martino, someone outside of the Barça “sphere”, strikes me as a good move. Palmeiras have made a solid start to this year’s Série B, with yesterday’s win away to Figueirense taking them to four victories in a row. Although leading the league comes as absolutely no surprise for a club of their size and wage budget, in this recent run of good form head coach Gilson Kleina appears to have done something once thought impossible: reinvigorate Jorge Valdivia. In his first spell at the Verdão between 2006 and 2008, Valdivia became an idol to the Palmeiras fans; since he returned in 2010, he has been nothing but trouble. High wages, absent performances, suspensions and a never-ending series of injuries transformed the playmaker into a target for abuse from the fans, especially during some of Palmeiras’ most abject seasons in recent memory. After his last injury in mid-March, Palmeiras torcida organizada Mancha Alviverde decided to create a “chinelômetro” (literally “slipper-o-meter” as injury-prone players are mockingly known as “little slippers” in Brazil) in Valdivia’s honour, tracking how many games the Chilean was missing and how much it was costing the club. The page still exists, although it hasn’t been updated since his return to form. Since that last injury however, Palmeiras have been extremely careful with Valdivia’s recovery in an effort to ensure some return on the millions of reais spent since 2010. The Chilean returned to light training months ago, and while his team-mates were resting during the Confederations Cup in June, Valdivia was training every day. When the Série B returned in early July, Valdivia went straight into Palmeiras’ starting line-up and was given a standing ovation in a 4-0 demolishing of Oeste. He has looked close to his old self, creating space for his team-mates, picking out near-unthinkable through passes and carrying the creative workload. His winning goal in yesterday’s match (albeit a simple finish into an empty net) drew a line under his return. It has been interesting to see how Palmeiras have altered their system to accommodate Valdivia’s return. Though he is traditionally a number 10, he has been playing in a role approaching that of a false nine, between two quick wide forwards. When Palmeiras are in possession, he steps back and leaves gaps in the opposing defence to be exploited by forward runs from the wide players, central midfielders or full-backs. However when Palmeiras lose the ball, it is the wide players who track back to defend, leaving Valdivia as the furthest man forward in a 4-5-1 shape. This could be an effort to conserve the Chilean’s energy by sparing him from any defensive duties, but having being closer to goal allows him to be more decisive. Palmeiras started yesterday’s match against Figueirense in that shape, but on a slow, wet surface they were forced to play long, aimless balls out of defence and midfield. 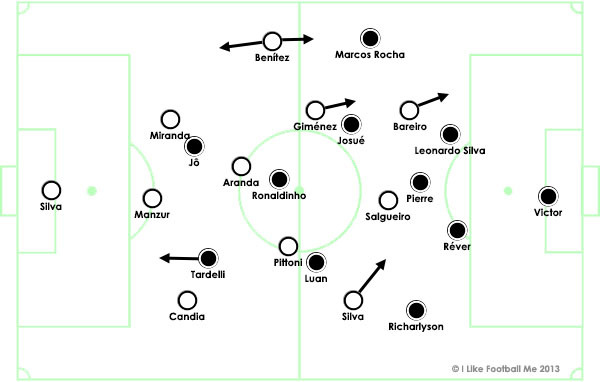 Without a proper reference point in attack and minimal space to exploit behind the Figueirense defence, Palmeiras were giving away possession constantly and Valdivia barely got near the ball. One-nil down at half-time, Gilson Kleina decided to bring on centre-forward Alan Kardec for his debut, and he brought Valdivia back into the midfield three. Kardec’s presence gave Palmeiras someone to aim for up front, meanwhile Valdivia and Wesley stayed close to the forward to receive any knock-downs. The game opened up considerably at that point, and Palmeiras eventually came back to win 3-2. Tomorrow evening I will be recording a guest appearance on the Clube Mondo Verde podcast, an excellent internet radio show created by Palmeiras fans, for Palmeiras fans. The other guest on the show will be none other than Gilson Kleina, so if you have any questions you would like me to put to him, leave them in the comments below or on the Facebook page. 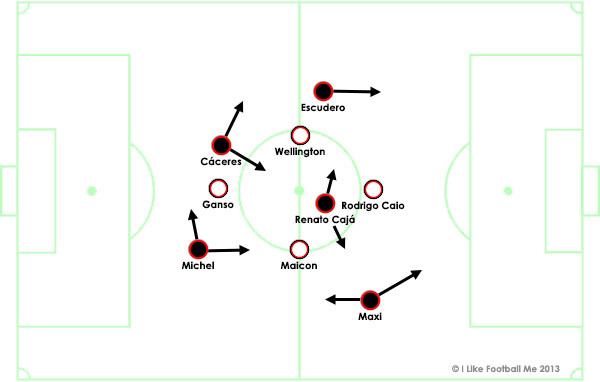 Two weeks ago, I wrote about how Cuca failed in his approach to Atlético-MG’s semi-final first leg away to Newell’s Old Boys. He instructed his team to play deeper than usual, abandoning their usual attacking style and shape in an attempt to stymie their opponent’s effectiveness. Their attempt failed and Atlético lost 2-0. Excellent coaches learn from their mistakes. Cuca is not yet an excellent coach. In last night’s first leg in Asunción, once again Atlético forsook their usual game-plan to try and hinder their opponents, and once again they lost 2-0. Their downfall last night against Olimpia was in their insistence on man marking. Cuca’s Atlético always mark their opponents individually, which is often frowned upon at the top level but can be effective when one team has a clear technical advantage. So far in this year’s Copa Libertadores, Atlético have faced teams that play variants of 4-4-2 or 4-3-3, which suit Atlético’s marking style. The full-backs deal with the wide midfielders or attackers and vice-versa, while the central players each have an opponent to watch over. 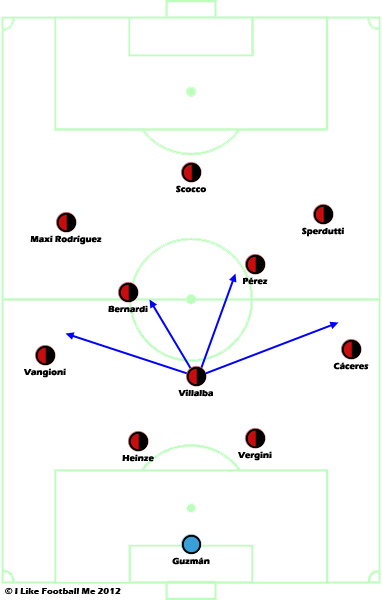 However, against Olimpia’s staggered 3-4-1-2 shape, Atlético ran into some problems. Without a full-back to play against, Cuca moved speedy winger Luan into a central role to cover Olimpia’s Wilson Pittoni, which changed Atlético´s overall shape into a rough 4-4-2 diamond. Left-back Richarlyson was assigned to mark Alejandro Silva, who despite originating in a wide position, constantly cut inside and took Richarlyson with him. On the other flank, Atlético’s Marcos Rocha was given a huge job, marking Olimpia wing-back Nelson Benítez whilst also being on hand to cover the runs of Matías Giménez and Fredy Bareiro whenever they broke past their markers. As a result, Marcos Rocha rarely crossed the half-way line. As if being forced to play an entirely different wasn’t enough, Atlético’s man-marking also resulted in Olimpia’s first goal. In the build-up, Alejandro Silva comes deep away from his marker and receives the ball close to Luan, who tries to retrieve possession from him. Instead of covering Luan, Richarlyson moves infield to mark Pittoni, who Luan has abandoned, opening space for Silva to run into. Diego Tardelli tries to close him down, but realising he is leaving his own man in space he hesitates to make a tackle. Réver, the only “spare man” in Atlético’s system, is then slow to get to Silva, allowing the Olimpia midfielder to score. Persisting with a man marking system and abandoning their usual style of play was a mistake by Cuca, but the popular media will probably focus more on another one of his decisions last night: substituting Ronaldinho after 65 minutes. Cuca was completely right to take off Ronaldinho. Thanks to a wonderful marking job by Eduardo Aranda (like Newell’s Diego Mateo in the semi-final), Gaúcho barely saw the ball. After his departure, Atlético started to create more and although they eventually conceded a second goal, they improved significantly. Once again, Atlético will have to do it the hard way and come back from 2-0 down if they want to win their first Copa Libertadores trophy. They will be without Marcos Rocha after he picked up a third yellow card, and as the match will be played at the Mineirão, they will not be able to count on the “Independência” factor. Coming back from this result will be a much tougher test than the semi-final. But that’s not to say it is impossible. On Wednesday evening, at the same time as the Copa Libertadores final between Olímpia and Atlético-MG, Corinthians and São Paulo will decide the 2013 Recopa Sul-Americana. I’ve never understood the Recopa. It’s South America’s answer to the Uefa Super Cup but unlike its European equivalent that serves as a harmless introduction to the league season, the Recopa strikes me as being poorly planned and frankly, it gets in the way. The problem, like many things in South American football, is the space it takes up in the calendar. It is played just as the Brazilian national championship is trying to gain momentum and after the other major South American leagues have come to a close. It is also contested over two legs, home and away. My other qualm is with the name. Tomorrow evening will determine the winner of the 2013 Recopa, even though São Paulo won the Copa Sul-Americana in December of 2012, and Corinthians won the Copa Libertadores over a year ago, in July 2012. The fact that the second leg clashes with the 2013 Copa Libertadores final tells you everything you need to know about how well-thought out this trophy really is. So, why do people pay any attention to it? Before the first leg, I asked a friend of mine – a São Paulo fan – this very question. Therein lays the Brazilian mentality toward sport. You could argue that many fans don’t love football; they just love cheering the winner. For the clubs involved, the Recopa is a notch on the proverbial bedpost. It might not be the Libertadores, but they all count, right? Here in São Paulo, extra importance has been placed upon this year’s edition as not only do we have two Brazilian teams in the final, we have two of São Paulo city’s trio de ferro, and both are desperate for a result. I have discussed São Paulo FC’s problems on more than one occasion over the past few weeks, and Sunday’s demoralising 3-2 defeat away to Vitória only served to drag them deeper into the thick stuff. In truth, 3-2 was kind on the tricolor, who were outplayed for the entire 90 minutes by Caio Júnior’s gutsy Vitória. While the home side were pressing hard, making overlapping runs and contesting every loose ball, São Paulo were absent, lethargic and looked mentally exhausted (see diagram below). Perhaps they could take a leaf out of Santos’ book and instead of indulging certain overrated and overvalued first team players, they could look to their youth squad and promote from within. It certainly couldn’t be any worse than their current situation, that’s for sure. Their opponents Corinthians hold a 2-1 aggregate advantage from the first leg, but they are also in a precarious situation. They have had few decent performances since the national championship got underway, and Sunday’s 1-0 home loss to a mainly second-string Atlético-MG side has made Wednesday’s second leg crucial. In Brazilian football, crisis is never more than two bad results away. Corinthians problem is different to that of their rivals. The effort is there, but the team is making too many mistakes in front of goal and in defence. Alexandre Pato, the most expensive signing in the history of Brazilian football, has underwhelmed, while goalkeeper Cássio is still living off his heroic performance against Chelsea in the World Club Cup final. The loss of Paulinho has also hit them hard. Tottenham Hotspur’s new midfielder was the lynchpin of this current Corinthians side, and replacements Ibson and Guilherme look to be a considerable step down in quality. In last season’s Brasileirão, Santos became completely reliant upon the presence of Neymar. With him on the field, their form was that of a top three team; without him, their form was worse than that of Sport Recife, who ended the season in 17th place and relegated. Less than two months ago, when Neymar sealed his transfer to Barcelona and head coach Muricy Ramalho was fired, Santos fans started to fear for their first division status. Since then however, they have not reverted to the woeful Neymar-less side of last year, in fact they have shown considerable signs of improvement. Last night’s 4-1 spanking of Portuguesa was Santos’ third consecutive league win, and they currently find themselves in 5th position in the table. Put simply, they have gone back to their roots. Santos has always been famous for producing their own talent, or as it is known in Brazil: “revealing players”. The all-conquering Santos of the early 60s with Pelé, Pepe and Coutinho leading the line; the 1978 side with Pita, Juary and João Paulo; the championship-winning team of 2002 inspired by Robinho and Diego, then just teenagers; the 2011 Copa Libertadores winners with Neymar and Paulo Henrique Ganso. After Muricy’s dismissal, Santos appointed under 20s coach Claudinei Oliveira as his temporary replacement. In January of this year, Claudinei’s youth team won the Copa São Paulo, Brazil’s most prestigious junior tournament, and since taking the reins of the first team he has looked to promote as many of that U-20 squad as possible. 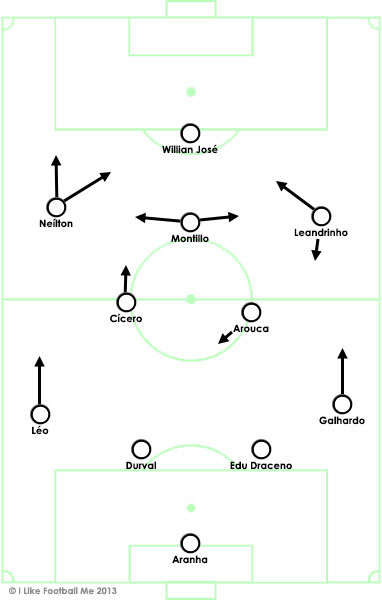 The most prominent examples have been attacking midfielders Neílton and Leandrinho, who have gone straight into the first eleven on either side of playmaker Walter Montillo in Claudinei’s new-look 4-2-3-1 system. Leandrinho is busy and technical with good dribbling skills, while Neílton is quicker and provides a deep threat down the wing and cutting in from the left. Also gaining space are centre-forward Giva, who came off the bench to score the opening goal in last week’s clássico victory against São Paulo, and tall centre-back Gustavo Henrique, who could well be the lubricant for Santos’ creaking back door. Although these players seem to have taken many by surprise, Santos’ general improvement on the pitch makes a lot of sense. Muricy Ramalho’s Santos played a negative style that was completely geared towards Neymar and his individual talents. When Neymar was unavailable, no-one knew where to pass the ball and they seemed devoid of ideas. With Claudinei Oliveira and the promotion of his young squad, Santos have a fresh approach and a new style, one which is attacking and attractive. I, for one, am looking forward to seeing this exciting new generation develop.